Occasionally the hectic nature of theatre booking throws up some delightfully apposite pairings. A fallow period has meant that, by chance rather by design, Everyman at the National has been followed by Like Mother, Like Daughter at the Battersea Arts Centre. It would be difficult to find two plays that better juxtapose the potential of theatre. Everyman was theatre as spectacle. Vast and impressive; the video and sound design had a forceful muscularity that carried through the choreography and into Chiwetel Ejiofor’s powerful central performance. Like Mother, Like Daughter was theatre as communal activity. All theatre is staged and performed but here there is no interest in bombast or special effects. It has confidence in the minimalism of its approach, and in the power of the stories it has to tell. For all of Everyman’s impressive showmanship, Like Mother, Like Daughter is the more radical. It asks question of the form that a theatrical experience should take, and of the functional purpose of the medium. It opens with an informal gallery containing a series of mood boards identifying the performers, their shared lives and the rehearsal process. The audience are encouraged to browse the profiles and to learn more about the background to the relationships between the mother/daughter pairings. It is theatre that puts the viewer in control. We choose how much information we want to hold about those taking part rather than having their stories hidden behind the paywall of a programme, or delivered directly to us during the performance process. We then watch the non-actors, real-life mother/daughter pairings, answer randomly assigned questions. Is this theatre or just voyeurism? Is it therapy or is it drama? Watching it, the answer is both. The reactions to hearing the question, the revealing nature of the answers – for the audience this is pure theatre, for the performer it must surely be a form of therapy. It ends with a communal meal. Audience members join with participants. It is an opportunity for reflection and to ask further questions of those taking part. The understated simplicity, the lack of pretence and the emotional honesty that comes from non-actors sharing their real lives helps lower the barriers between viewer and performer, creates a discussion and makes it a genuinely participatory experience. It may well be the case that – just by virtue of taking part – the participants are not representative of mother/daughter relationships. Those with more tense relationships may not want the bonds tested in such a public setting. Despite this caveat, it is still fascinating to see that cross-cultures and generations there is a universalism to the experience of being a mother, being a daughter. Watching the audience confirms this. 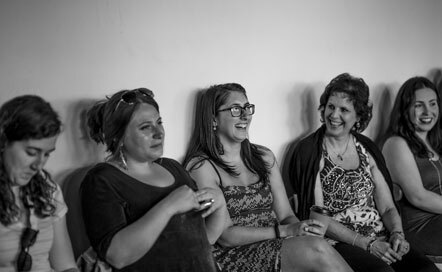 The reactions of the mothers and daughters in the audience were as interesting as listening to the stories on stage. The nodding of heads, or the knowing chuckle, shows the common threads that make clear that the same discussions, the same questions and, most likely, the same responses are happening in homes up and down the country. Like Mother, Like Daughter provides a compelling example of how there are different way to unite communities. We may not share ethnicities or religion. Our incomes may differ and we may vote for different parties. Yet all mothers are mothers, and all mothers are daughters. No amount of religion, cultural identity or political rhetoric can change that basic fact. In a society that can appear increasingly fractured, here is a powerful reminder that if we just alter the prism through which we view each other then it need not be hard to find common ground. The creatives that have put this show together may be too polite to say this but Why Not Theatre have come up with a form of immersive theatre that, for a fraction of the budget, puts the pretentious, elitist spectacles of You Me Bum Bum Train and Punchdrunk to shame. Like Mother, Like Daughter is genuinely immersive. How often do you break bread with performers and be given an opportunity to delve further into their motivations? How often are you provided with the chance to take what has been talked up and discuss them with complete strangers? This is radicalism that doesn’t feel the need to badge itself. Like all the best ideas, it would rather spend its time doing something quietly radical then loudly telling everyone how radical it is.